Heat oven to 450°F. Unroll pie crust onto work surface. Use 4-inch round cutter to cut four 4-inch rounds from crust. Press each round into 4-inch tart pan; prick bottom with fork. Bake 5 to 9 minutes or until golden brown. Cool completely, about 15 minutes. Meanwhile, in small bowl, beat cream cheese, powdered sugar and whipping cream with electric mixer on medium speed until smooth. Divide evenly among cooled tart shells. In small bowl, stir grated lime peel into lemon curd until smooth. Spoon evenly over cream cheese mixture in shells to within 1/4 inch of edges. 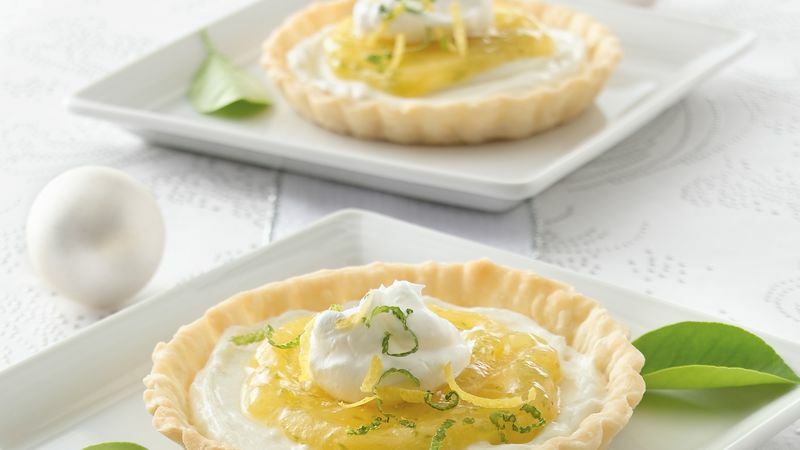 Garnish with whipped cream and strips of lime and lemon zest. These elegant tarts can be made up to a day ahead of time.